Say hello to Beeny, a very cute 3 1/2" bear made of short, velvety soft, pale grey Schulte mohair. We have combined this for his tummy and ears with deep aubergine German alpaca, soft and dense and it stands out well against the grey. His pads and paws are black cashmere, he has a deep purple stitched nose and shiny black German glass eyes. 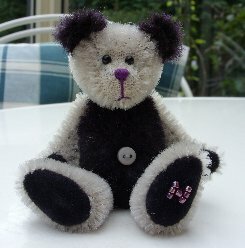 Beeny is one of the bears in our Cornwall Collection. He is steel shot filled and so nice and heavy for his size. He has a pale grey belly button and as you can see from his photo, a very sweet little face. I hope that you like him, he costs £36 plus postage. Please note that as with all our bears Beeny is not a toy and is not suitable for children.